I'm still running a week behind trying to blog what we've done each week. These first few weeks of school have been busy, busy, busy! I am steady working with the small people doing school from 8 am to 2:30 pm every day. Then we start with the afternoon activities - ballet on Monday afternoons for Little Red and Sassy Pants, ballet on Tuesday and Thursday afternoons for Ballerina, soccer on Tuesday and Thursday afternoons for Soccer Girl and The Boy, boy scouts on Monday evenings for The Boy, and church activities on Monday and Wednesday evenings for the family. I know that as we get adjusted to the schedule, it will calm down a bit. So, what did we learn last week? Bible - We are studying the life of Joseph. Last week, we studied how his brothers sold him as a slave. We talked about how jealousy and lying anger God. History - We are still learning about Ancient Rome and the Roman Empire. We learned about how towns were set up in grid patterns and about the layouts of the houses of the wealthy people. 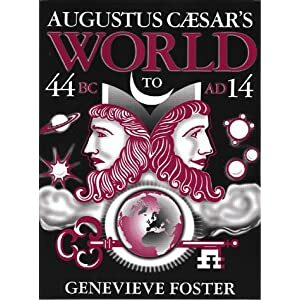 We began reading Augustus Caesar, where we learned about the assassination of Julius Caesar and how Octavian and Antony began their attempts to control the Roman Empire. We also learned how to play a game that was popular in Ancient Rome, called Odd or Even. To play this 2-player game, you need 20 small stones (or something similar - we used the pieces from our Mancala game). Each player starts with 10 stones. The first player hides any number of stones in his right hand. The 2nd player must guess if there is an even or odd number of stones in the hand (saying only "even" or "odd"). The first player opens his hand. If the guess is correct, the first player gives the 2nd player a stone. If the guess is incorrect, then the 2nd player has to give a stone to the first player. Then it's the 2nd players turn to hide stones in his hand. Play continues until either one player has all the stones, or a set number or time. 1st Grade - Little Red continued her review of the letters and their sounds. Preschool - Sassy and I spent time learning about shapes. We used the Lauri Fit-A-Space puzzles to sort shapes and play games with the shapes. One game we played was Sassy had to close her eyes and choose a shape out of the pile. Keeping her eyes closed, she had to determine what shape the piece was by feeling it. I absolutely love how she says the word "parallelogram". Sassy's still trying to adjust to the idea that my entire day will not be spent teaching her, but it's getting better. Also last week, the Children's Choirs at our church performed their summer musical. Each year, the rising 6th graders perform the drama for the musical and all of the choirs (grades 4k-6th) sing with it. Since The Boy is one of those rising 6th graders, he was a part of the drama. This year's performance was Kings, Dreams, and Schemes, and The Boy had the role of King Belshazzar. He did a great job! The older three girls enjoyed singing.